Successfully Added Xiaomi Redmi Note 4 Android Phone - 64GB Memory, Deca Core CPU, 3GB RAM, Android 6.0, 5.5 Inch FHD Display (Blue) to your Shopping Cart. The Xiaomi Redmi Note 4 Pro is an affordable Android phone that comes packed with latest software and sophisticated hardware alike. Supporting two IMEI numbers, this Android smartphone allows you to be reachable on two phone number simultaneously. If you are looking for a mobile phone that offers great connectivity and an efficient way to separate your work and private life, this Android mobile phone is the ultimate device for you. It furthermore supports 4G connectivity through which it brings along lightning fast data speeds on the go. Whether you’re at home, in the office, or out of town – this 4G smartphone will always keep you connected to your friends and loved ones. Featuring a sleek design with a stunning 5.5 Inch Full-HD display, this Android mobile phone certainly is a feast to the eye. 1080p resolution lets you enjoy all your favorite media in breathtaking detail and vivid color – letting you take the absolute most out of all Android applications, movies, and demanding smartphone games. Running on the trusted MIUI 8 operating system, it comes packed with the latest Android software features – guaranteeing a smooth yet powerful experience every time you turn on this Android phone. With its 4100mAh battery, it provides countless hours of continuous usage time. From now on you’ll be able to head out with confidence as running out of juice is no longer an issue to worry about with this powerful Android phone. 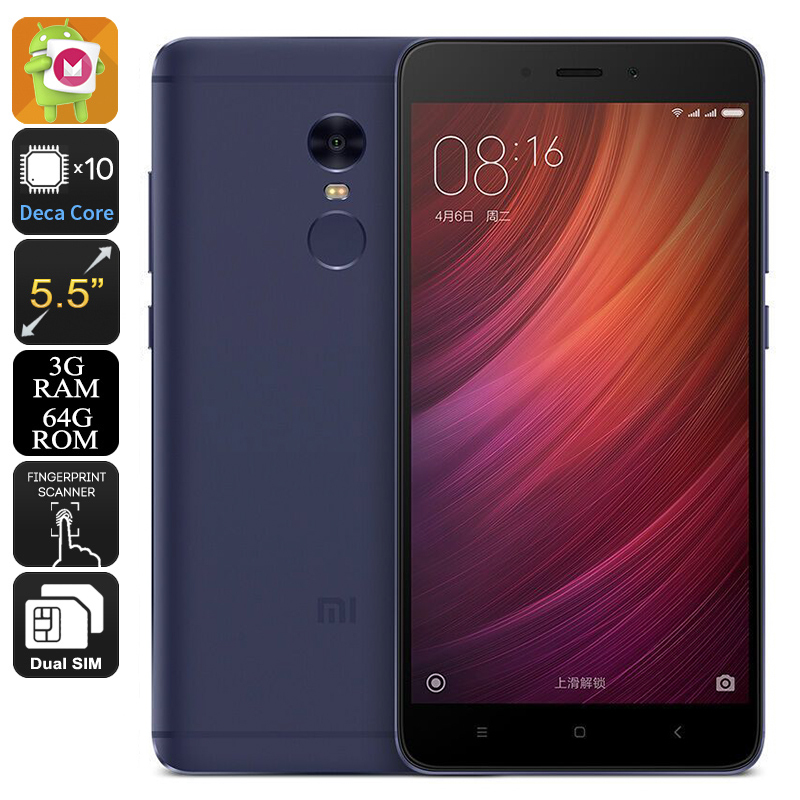 Within its sleek and stylish body, the Xiaomi Redmi Note 4 Pro packs an epic Deca-Core CPU that can reach clock speeds up to 2.1GHz, as well as 3GB of RAM. With all this power at hand, this cell phone is sure to deliver an outstanding performance that is capable of handling the latest Applications and most demanding mobile games without dropping a frame. Supporting 64GB of internal memory and a 128GB SD card slot, this mobile phone offers plenty of space for you to store all your downloaded files and media. At the rear of this beautiful Android smartphone, you’ll be able to find a high-end 13MP camera that allows you to shoot photographs and video in great detail and stunning beauty. Under its professional-grade camera lays an ultra-fast fingerprint scanner that unlocks your phone in the blink of an eye. From now on you’ll be able to access all your files, photo’s and more with the simple touch of your finger and never have to worry about remembering those annoying passwords or unlocking patterns again.